For my final Rush show on the Snakes & Arrows tour, I went with my brother and his girlfriend Helen. They picked me up around 2:00, and we drove straight to the amphitheater (only stopping off at Wendy's and a rest stop). As usual, Erik and I talked (Helen wanted to sleep in the back). When we got to Clark County, three or so hours later, I stepped out into surprisingly cold air. I'd worn shorts, and I was trying to decide whether to put on my sweats. Instead, I just put on a North Face jacket, and then we walked to the venue. Even though we had an hour or so before the show started, I ended up passing the time quickly by talking to friends. Monica told me that Ray had talked to Howard, Rush's lighting director, about the Gorge show the night before. Howard said that it had been a very difficult concert for the crew, and that he'd lost a bunch of lights and lasers due to the wind. He said that instead of going to the after-show party with the crew, he ended up going right to bed. He was looking forward to playing the show at Clark County. 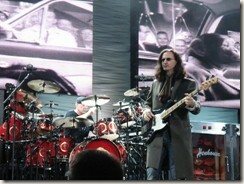 When the show started, Geddy came out wearing a long coat. He also had a scarf wrapped around his neck. Seeing this made me feel even colder than I already was. The band sounded great, and at close range they looked like they were having fun. As with every show at Clark County, the shortest man in the venue ended up standing behind Erik, who stands at 6 feet 7. The problem was, he really couldn't stand behind Helen or me, as we both stand at or over 6 feet. Somehow, he ended up moving down his row where he could see better. In general, people seemed to be moving around quite a bit. During the intermission, I walked up to the restroom with my friend Keith, and we talked about what we'd been doing since we'd last seen each other. As we were standing in the mile-long line at the restroom, we saw a bunch of security people and finally Sheriff's deputies run into the bathroom. I never did see them pull someone out, but it sure looked exciting. Monica told me that Steve had been shut down from taking pictures by Michael Mossbach, Rush's security director. He found it odd that he was the only one Michael targeted, as everyone around them was either taking pictures or video (or holding signs that blocked the view). During the second set, I wasn't getting any warmer. In fact, I think the temperature dropped into the low 50s (F). 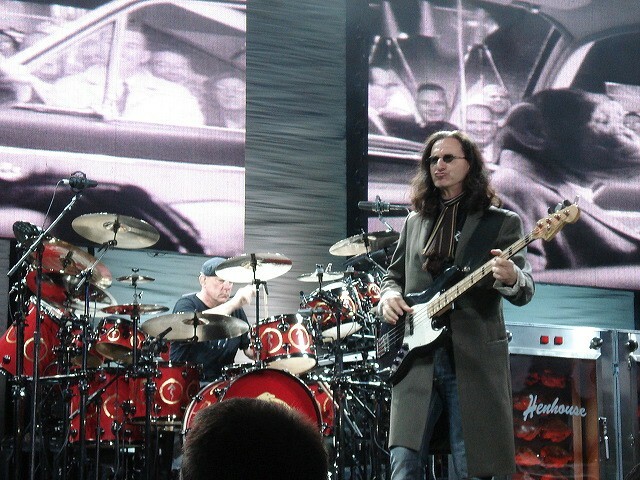 Geddy continued to wear the long coat and the scarf across his neck. I noticed a lot of activity off the stage, with Rush security people scanning the audience. They seemed to be pointing right at me, although I wasn't taking any pictures or doing anything other than air drumming (when appropriate, of course). Sure enough, Michael inched by me and then waited behind a guy who was taking pictures. Then he tapped him on the shoulder, and, from what I could tell, erased every picture the guy had taken. What was odd was this guy was with the golf guys that Alex had acknowledged, and was wearing a backstage pass on his shirt. When the band played Witch Hunt, I saw Geddy warming his hands on the fire, which I thought was funny. But I have to admit the heat felt pretty good. As the band got closer to the end of the show, some other interesting things happened. During One Little Victory, Neil seemed to miss the hi-hat downbeat he plays along with the double-bass. He ended up switching the beat around until he found the downbeat. What was strange was at the end of the song, he did the same thing. It almost sounded like he was bored and trying to find a new way to play the beat. During YYZ, Alex made some big boo-boos. During the chorus, he started on a wrong note. He looked back at Neil, who was laughing at him. He kept making self-deprecating gestures to the audience -- like holding his nose as if to acknowledge his poor playing. This show marks the end of my Snakes & Arrows tour. 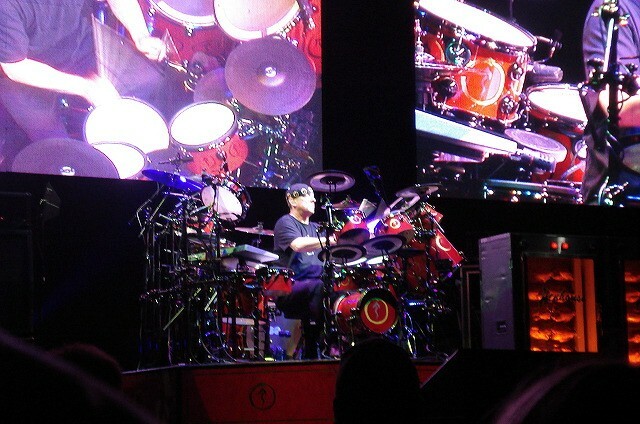 The band is going on to play many more shows, but between the 2007 and 2008 tours I've seen Rush nine times -- including my first ever Toronto shows and Ottawa. I remember when I used to see these guys once every two years. People always ask me why I attend so many shows, and I guess the simplest answer is that Rush's music makes me happy. It reminds me of why I picked up the drum sticks. It inspires me. It gives me an excuse to travel to places I've never been, and see friends I haven't seen in a while. There aren't too many things that can do that for me.